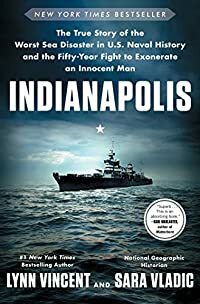 Book - Indianapolis: The True Story of the Worst Sea Disaster in U.S. Naval History..
• Author: Lynn Vincent, Sara Vladic..
• Book Publisher: Simon & Schuster..
• Title: Indianapolis: The True Story of the Worst Sea Disaster in U.S. Naval History and the Fifty-Year Fight to Exonerate an Innocent Man. • Cover Type: Hardcover.. 592 pages..